universal foam insert at a fraction of the price of other case insert builders! a U.S. Army Special Operations Ranger-owned company. So you can trust they're made right! • Makes the inside of your case as indestructible as the outside! • Keeps gun and accessories separated inside and cushioned, protecting from damage during transit. • Provides inventory control by allowing a quick visual check of items present. ​WHAT MAKES GUNFORMZ GUN CASE INSERTS BETTER THAN THE REST? These case inserts are created using CNC waterjet cutting that produces a clean, precise, non-deformed edge nearly impossible to achieve with any other production method including hand-cutting and using Pick 'N Pluck foams. Two-pound, single-layer, closed-cell polyethylene foam is used that holds shape without crushing or deforming from use, and is impact-resistant, oil and solvent-proof, anti-bacterial, and 100% recyclable! The closed-cell foam also resists humidity and moisture absorption thus preventing corrosion, discoloration, etc. ​This CNC precision-cut foam does not leave behind black dust that contaminates gear nor does our cutting method create tiny slices that cause foam to break down sooner as is common with Pick 'N Pluck type foams. The semi-custom pre-cut universal designs we offer accept a variety of customized weapon configurations with the use of assorted cut-outs and saves you the hassle of trying to create a sleek case insert. This case foam fits your items beautifully without the choppy, square cuts of Pick 'N Pluck. 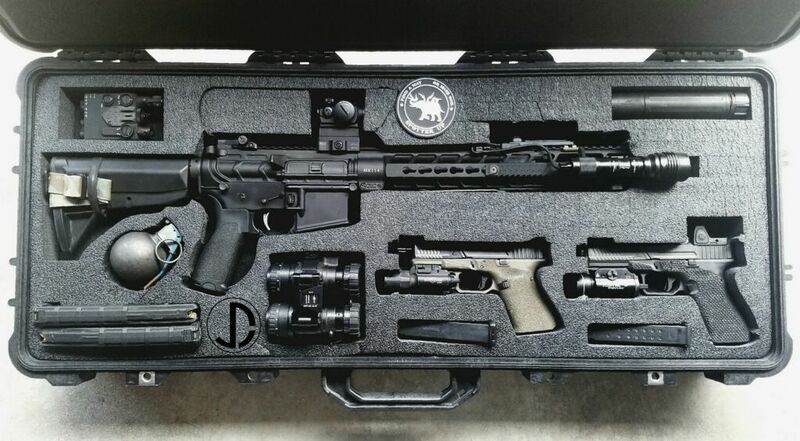 The rifle case inserts fit most standard accessories including magazines, ammunition boxes, bi-pods, optics, batteries, shoulder straps, lights, bolt conversions, silicon dry packs, and more! Available accessory cut-outs can hold additional items of your choice. Provides a clean, professional look for your prized possession! *For case purchased with foam. **Case not included with purchase.